Hi, everyone! There is a fabulous opportunity available to three special people if they are selected for the MarkerPop design team. The call ends on Friday, June 3rd. What are you waiting for? I've been a huge fan of MarkerPop for a while now and I often participate in their monthly challenges. Last year, I was honored to be invited as a guest designer on their blog. I love to color with Copics and my Zig clean color real brush markers. So, I am putting my name in the hat for a chance to be on their design team! Wow! What an opportunity that would be!! Today, I have a card I created for a friend who recently retired using my Zig markers. 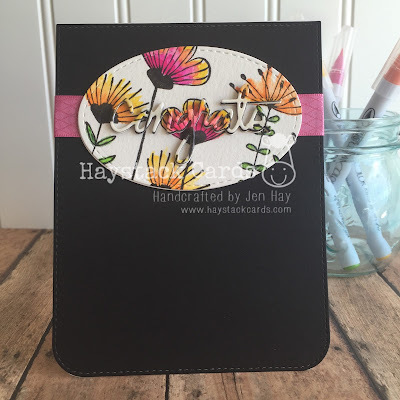 First, I stamped the flowers from the My Favorite Things sketched blooms stamp set in Versafine onyx black ink onto watercolor card stock. I colored them up and then die cut the panel with my stitched oval die. 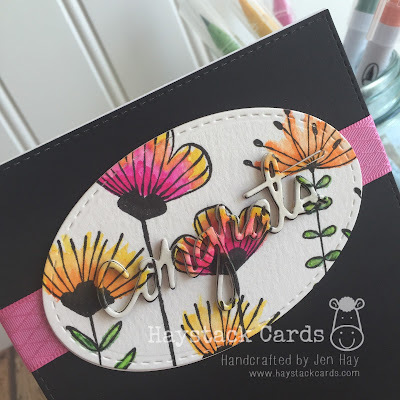 I die cut the sentiment once from the stitched oval as well as a few more times out of black and white card stock. 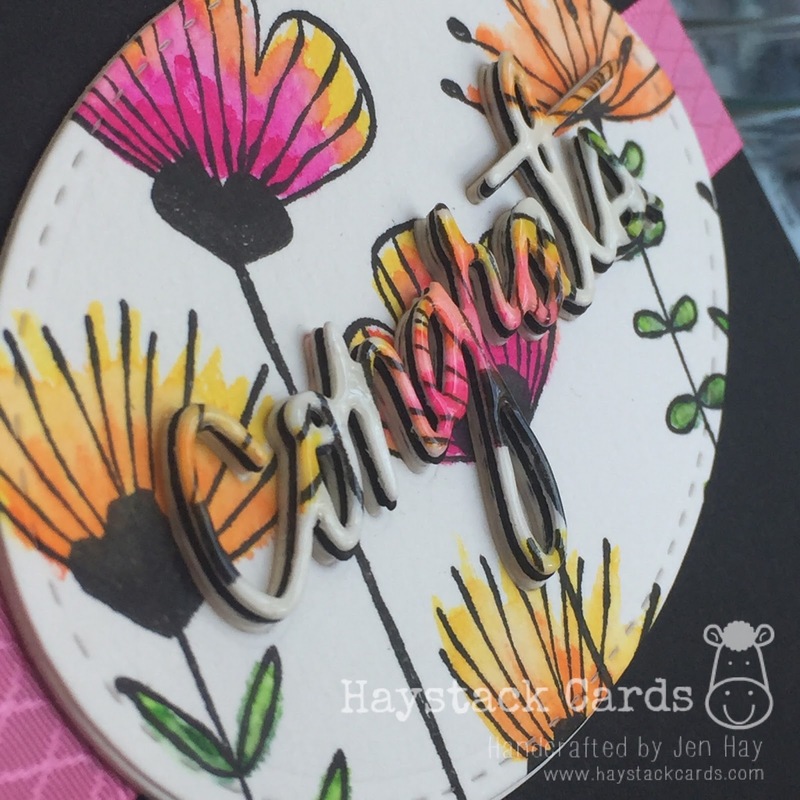 I glued all four words together using glossy accents making sure the watercolored layer was on top. Once I had the sentiment secure, I added a coat of glossy accents for some shine. To keep the card front from becoming too busy, I simply die cut a stitched panel from MFT Blueprints #26 out of black card stock and added a pink diamond satin ribbon to the card base. Don't forget to apply for the MarkerPop design team call. It's a once-in-a-lifetime opportunity if you are enthusiastic about card design, coloring, and inspiring the creativity of others! !